Rubenerd: A Keith Olbermann Bobblehead! Having just talked about him yesterday (Keith Olbermann’s Countdown as a podcast), I just found out through his show's site you can buy a Keith Olbermann bobblehead complete with a little desk! Keith Olbermann Bobblehead — Now you can sit down with your favorite MSNBC personality, Keith Olbermann. 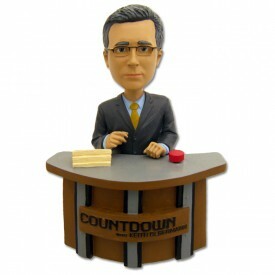 This new bobblehead features the talk show host seated at his Countdown desk. You’ll have a front row seat for all the action. I reckon he'd go great with my anime figures, they could all set up some sort of weird newsroom ^_^. If anyone wants to buy me one, let me know and I'll forward you my address. Don't all rush to offer at once!